One of the challenges we face in the recruitment industry is how long it takes to get a brand new person up to speed in recruitment. Its an ongoing dilemma; do you hire an experienced person and pay for the privilege and hope they start billing quickly, or do you hire a brand new person for a cheaper rate but wear the extended cashflow drain before they are established? As shown in figure 1, if you go the new person at the end of a 12 month period you can still be in the red. This is all dependant on how quickly you can get them generating revenue. At Recruitment School, we have been through this too many times. In fact when we were managing an agency we decided to build a recruitment training platform that we could use to bring people in and get them up and speed as quickly as possible. This is critical to being able to get our new people covering their costs as quickly as possible. In fact after applying this methodology we took that business from loosing $200,000 per month to generating $900,000 in Gross Profit per month and it only took us two years. 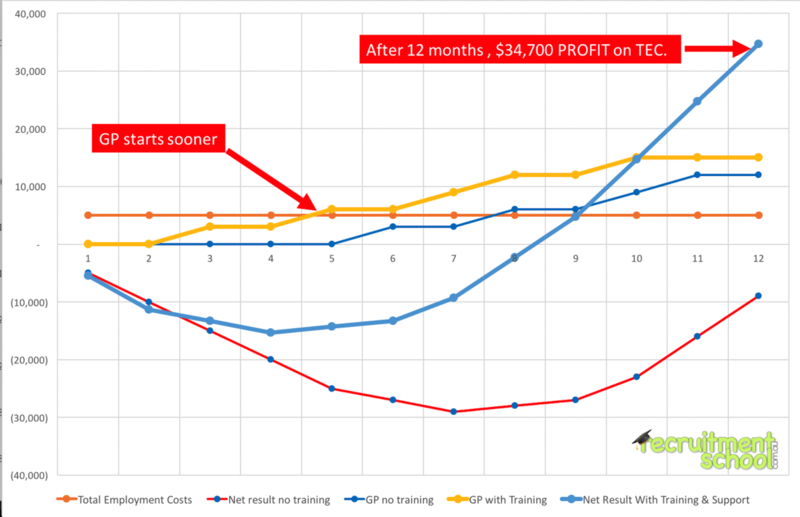 As you can see by figure 2, if you apply the right training and support you will have a profit of around $34,000 on TEC within 12 months. That is amazing and your staff turn over will be less because people are feeling good about themselves. 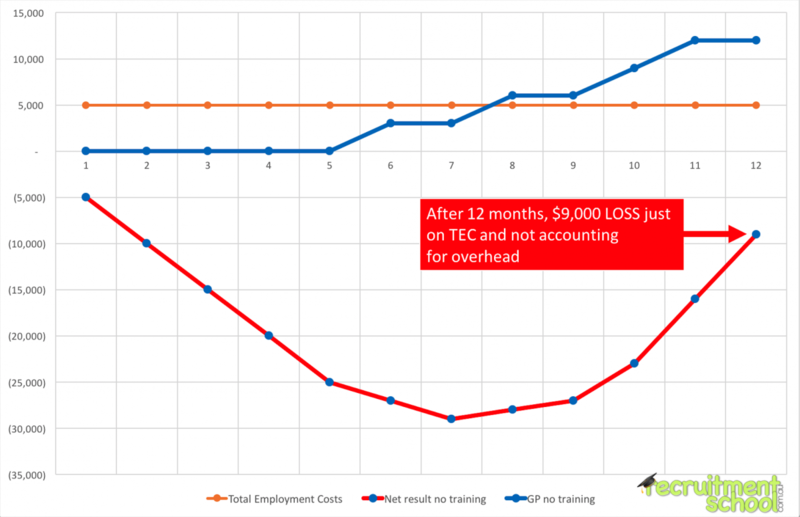 And you know the crazy thing, we have included the training cost of $498 and the cost of 3 months support at $798 into figure 2. So the total costs was $1,296 and there is a 2,678% return on the investment, and thats being conservative. 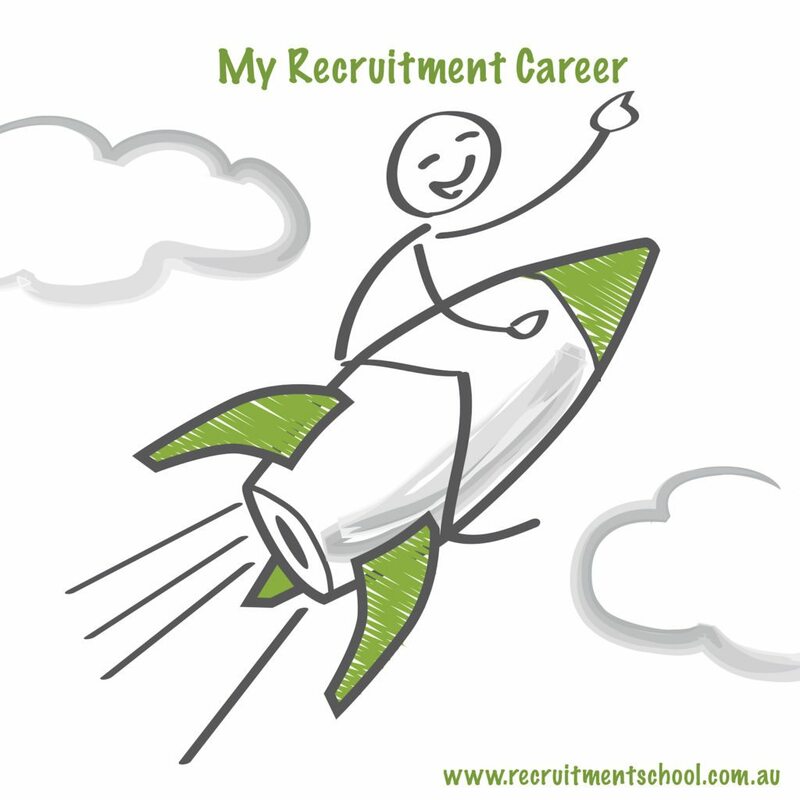 Recruitment School is the only training you will find that has been built to help you get new people up and running as quickly as possible. If you would like to know more about how we can help you, contact us by clicking here or subscribe to our newsletter below. Thanks Nicole. The whole idea of the site and all of our training is to help people get into the recruitment industry and be successful. Soon we will be adding more training for people who are already in the industry, e.g, understanding finance, how to become a manager, etc etc. I look forward to chatting to you soon.